Daily Illuminator: Munchkin Is Everywhere! The majority of our manufacturing flows through the GPI offices and factories, where they produce everything from Zombie Dice to Munchkin Warhammer 40,000 to The Fantasy Trip Legacy Edition. We've produced millions of units (of games, expansions, and accessories) in their factories over the last decade, and they're consistently our first choice when working on a project. That doesn't mean, though, that we don't investigate options, and that's exactly what led to a fun discovery. Print Ninja is a company we had never worked with, but I have friends who have printed magazines and books through their website. The company's online quoting tool for books is an excellent resource for the times you want a rough idea of what something may cost . 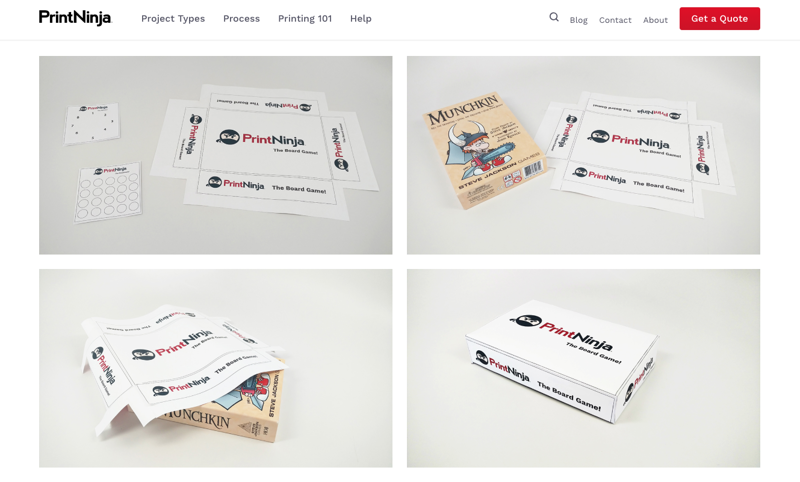 . . and it turns out that they have a similar tool for producing board and card games. It was while looking at their game-manufacturing options that I ran across this page on one-off prototypes and their guidelines on how to create an early prototype of your newest game design. "Get creative and recycle – Find a used game – eBay is full of them – that has the same game board, or outer box dimensions that best match your game. Now, prepare your board game image with some spray adhesive and glue it over the existing board. Boom, now you have your own playable board! Follow this same procedure with boxes, punch-outs, tiles or any other component."